Two years ago, Millennials (born between 1981 and 1996) passed older generational groups to account for the most new mortgages. Today, Millennials also account for the most total dollar amount of those mortgages. Given the state of ongoing median sales price increases in the majority of the country, this should not come as a surprise. And given the positive state of the U.S. economy, finding the correct balance between positive sales figures and sales prices will be a dominant theme of 2019. The National Association of REALTORS® has reported in the last month that national existing-home sales and pending sales are both down in year-over-year comparisons, but that has not necessarily been a constant from market to market. While weather-related events have hampered some of the necessary machinations of making home sales, buyers have shown determination toward achieving their homeownership goals. This week has shown some sales strain in many markets, but spring is just around the corner. The latest numbers show that 2019 was off to a good start for TwinCities residential real estate. 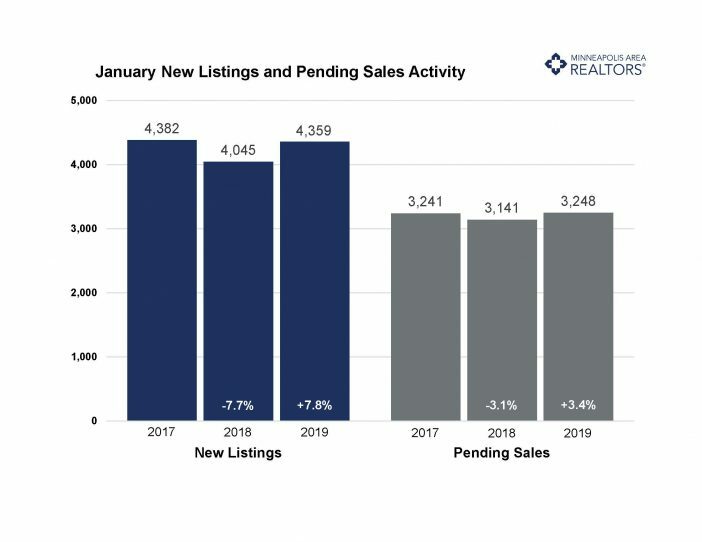 Sellers produced another increase in listing activity, while buyers entered into more contracts than last January even while closed sales fell. Market times continued to shrink as the median sold home price rose compared to last year. After two months of declines, the ratio of sold to list price rose slightly in January. There are some early indications the market is improving for buyers, even though sellers still have strong negotiating leverage and quick market times. The number of active listings for sale has increased compared to the prior year. Buyers have seen inventory gains for four consecutive months. Months supply also ticked up to 1.6 months, suggesting the market is still tight but rebalancing and normalizing. After increasing to 5.0 percent in November, mortgage rates have settled back down around 4.5 percent. The lack of supply is especially noticeable at the entry-level prices, where multiple offers and homes selling for over list price are commonplace. The move-up and upper-bracket segments are less competitive and better supplied. Inventory could rise substantially, and we’d still have a balanced market. For the third of four weeks, it is worthwhile to mention the weather when discussing residential real estate in large portions of the U.S. After a relatively quiet December and January, February has turned in some impressively cold and snowy days that have stalled some buying and selling actions. That said, housing markets are proving to be resilient in the face of predictions of a tougher year for the industry. It’s early, but economic fundamentals remain positive.